I really enjoyed this puzzle. 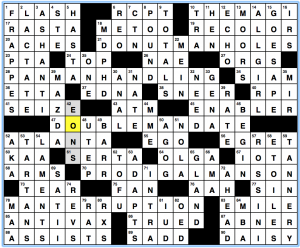 While it may have seemed more enjoyable because the Tuesday puzzle was so bad, I think it would stand on its own. It’s a nice midweek puzzle with some zippy fill and a wordplay theme that made me smile. Each theme answer is a common word or phrase with AT appended at the end. Wackiness results. 20a [Big “but”?] is MAMMOTH CAVEAT (Mammoth Cave). I like big caveats and I cannot lie…. if you haven’t been to Mammoth Cave National Park, it’s worth the trip. It’s even more fun if you bring along your own geologist. 27a [Small diamond handed down to an heir?] is an ESTATE CARAT (estate car). “Estate car” is another term for “station wagon.” I think of “estate car” as a Britishism. Wikipedia confirms. Apparently “station wagon” is used in the US, Canada, Australia, New Zealand and African English. Gareth? 44a [Fight between two lovers?] is HONEY COMBAT (honeycomb). Now I have this song in my head. 55a [Futuristic Volkswagen?] is a FORWARD PASSAT (forward pass). This may be my favorite. Consistent, amusing, solvable. A solid Wednesday theme. 1a [Menaces that name other menaces if you put a “w” at the start] is ASPS, which transforms into WASPS. I wonder if that’s Kathy’s clue or Will’s. It reminds me of the Sunday puzzles he presents on NPR. 2d [It comes a quarter of the way into the day] is SIX AM. I beg to differ. That is the beginning of the day. Prior to SIX AM, it is night, not day. 6d [What an oatmeal bath alleviates] is ITCH. This time they got the medical clue right. Oatmeal baths with tepid water are a wonderful itch remedy. 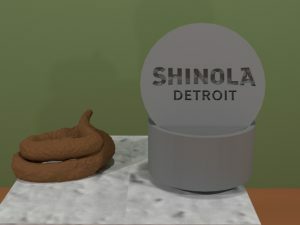 There are commercial products, or you can do what my mother did: put oatmeal in an old sock and run the bath water over it, leaving the sock in the tub. It works like a tea bag and you don’t have to clean oatmeal out of the tub. Cornstarch will also work but you need to use a whole box for each bath. 18a [Subject of a parent’s restriction for a child] is SCREEN TIME. This is a hot topic among my parent friends. True confessions: Emma is currently in her room using a desktop computer as a TV while she does homework on her laptop and Snapchats on her phone. 45d [Bullies] is COWS. I stared at that for a minute wondering how bovines could be bullies. Then the light dawned. 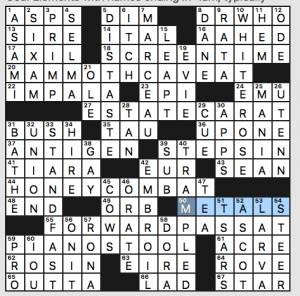 What I didn’t know before I did this puzzle: that most elements ending in -ium are METALS. I suppose I would have realized it if I’d ever thought about it, and David (who memorized the periodic table in high school because he’s just that kind of nerd) was surprised that I didn’t know. Theme: Two-word phrases in which the first word can be a slangy synonym for “epic!” The second word does not appear to change meaning. 17a [Amazing mammoth?] KILLER WHALE. This one confuses me. How is a mammoth a whale? If both words are metaphoric, then this is inconsistent with the rest of the entries. 24a [Great enthusiast?] DOPE FIEND. Each of us here, e.g. 36a [Excellent wages?] SICK PAY. Nice. I like this one. 49a [Well-done finales?] TIGHT ENDS. Do people still say “tight”? I feel like we said that in the early ’80s but I haven’t heard it recently. 57a [Awesome speller?] WICKED WITCH. I love this use of the word “wicked.” I feel like it’s a Britishism we adopted. Ah, I think I was right, according to this site. However, the use of “wicked” as an adverb, as in “wicked awesome,” comes from New England, and Boston, specifically. Fairly standard but fun theme set nonetheless. Also good: The stacked-eights in the NE and SW corners, especially O SOLE MIO, MADE NICE, GOOD DEED, CLUTCHES, and HOT IRONS. More good stuff: PULL TAB, CRAYOLA, and YAPPING. I wasn’t sure about OF A KIND at first, but it’s growing on me. Favorite clue: [Sugar substitute?] for HON. There’s kind of a lot of DRECK, though: SAO, ODO, ENC, SSE, ETH, ARI, AMIE, KAN, ERG, ATRA, ELS, etc., but nothing we’ve never seen before. You may say that MANTERRUPTION isn’t a word, and I’ma let you finish, but it dates back to at least 2015, when multiple news articles talked about the trend. I’ll give you that it’s a terrible portmanteau, though. 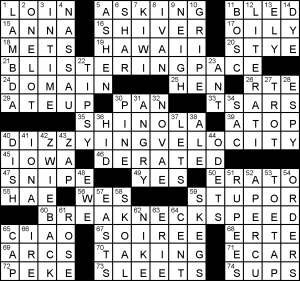 Going to use 40A’s “Upstate New York engineering sch.” clue for RPI to make another pitch to crossword constructors: RHIT is an engineering school in Terre Haute, IN, on the WABASH river. It’s a very good engineering school. 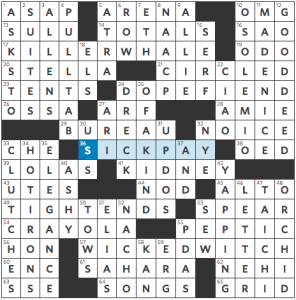 It has crossword potential. Thank you for your consideration. ATLANTA is back in March! I am very excited because season 1 was very good. Going to take a quick moment to note that 79D’s Pizza RAT video might have been faked. Just three theme answers today. They are each an ADJECTIVE+NOUN that means very fast: BREAKNECKSPEED and BLISTERINGPACE go together idiomatically. DIZZYINGVELOCITY… doesn’t. It’s completely arbitrary green paint. ONELOT and ECAR seem similarly contrived. This entry was posted in Daily Puzzles and tagged Kathy Wienberg, Nate Cardin, Paolo Pasco, Roland Huget, Samuel A. Donaldson. Bookmark the permalink. Next month is the 75th anniversary of the arrest, “trial” and execution of the members of the WHITE ROSE. It would have been nice if the clue had paid tribute instead of the generic clue we got. But I liked the puzzle. It feels like a throwback, in a good way, to when themes could just be fun and not overcomplicated. LOVED the AVCX. Great puzzle! I liked that Li’l ABNER was right above DAISY but they were clued differently (and I learned another actress). Liked the AVCX, but someone should tell the young constructors that “presently” means “soon,” not ATM (at the moment). Honestly, I did not get the connection between “Bullies” and COWS until I read this post. Got the entry from the crosses but was scratching my head about the clue until now. Nice wordplay there. And even though I’m a chemical engineer, it hadn’t before dawned on me about the connection between -ium and METALS. But seriously, Jenni, on the SIX AM? It makes perfect sense in terms of a 24-hour day. I got that one right away. Still, nice commentary overall. I’m fairly certain Jenni was referring to “day” as in the portion of the 24 hour period in which a person is awake. Sometimes people make humorous comments about certain times they find it too early or too late to be awake and alert. I got her joke right away. If I wake up at 4am tomorrow worrying about stuff (as I did today), the first thing I’m going to think about now is what percentage of the day it is. Thanks for adding to my reasons for insomnia. Hey, Mike, I love the way you condescend after you’ve missed my joke. That’s a good look for a guy. I’m not sure I catch what’s beyond the pale about the clue. Charles MANSON is a serial killer of note. Were the clue to go into explicit detail of Manson’s murder of Sharon Tate and the four other people in the home at the time, I’d agree the clue went beyond the pale (and wasted valuable page space for just one clue!). As it is, the clue notes that Charles Manson was a serial killer whose name can be inserted into PRODIGAL SON by adding MAN. Didn’t bother me one bit. We have Idi Amin in puzzles all the time. Station wagon is what we use here too. Our main outlier in car terminology is bakkie for what Americans call a pick-up and Australians a ute (rooting in the ute). Astronomical “Day” ~23:56:4.1 – ’tis why we need Leap Year and the occasional Leap “Day”. I apologise just this once for being a total M&S Nerd.